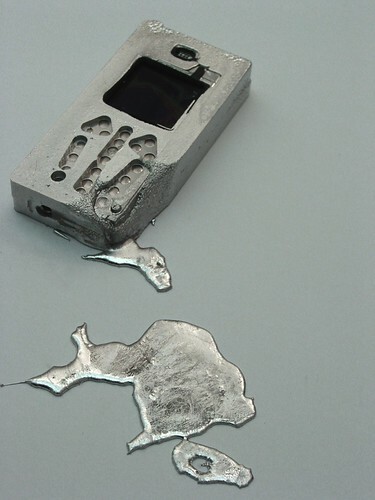 Investigating mobile phone personalisation with Nokia through material exploration, and a metal phone that changes form while you wait. BERG worked with Nokia to develop experimental prototypes to explore personalisation in mobile phones. There are three overlapping strands in the project: craft, hacking and mass customisation. Craft is broadly about working with people who have specialist skills in the areas of making; by hacking we are referring to combining the phone with other objects or interfering with the phone functionality; mass customisation refers to processes and materials available to small or local manufacture and appropriate to short run production. BERG worked with specialists to produce material explorations, and posted the findings on this project blog. Have comments or feedback? Let us know. This project blog discusses our work. S&W was commissioned by Chris Heathcote of Nokia’s Insight Foresight Group. All work remains the property of Nokia and permission is needed for any reproduction.